I’m so proud of myself. I experimented with week two’s TAST stitch – the buttonhole stitch earlier this week. In fact, the only reason I didn’t post earlier was because my pictures came out too dark. We had a snow storm yesterday and it was hard to get a decent photo. For some reason, I was thinking about spirals, so decided to draw one on my fabric and follow around the line with the buttonhole stitch. I wanted the spiral drawn line to stand out, so added dimension and strength to the line by adding glass seed beads (Mill Hill Color # 330). And for those of you who would like to see how I added them, I took some additional photos of the stitching in progress. Pull the needle through the fabric, and that’s all there is to it. 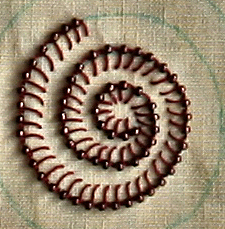 Add another bead on the needle, slide it into place, take another stitch and before you know it, you have a beautifully embroidered spiral design. I hope you enjoyed seeing what I did with the buttonhole stitch, and my little mini tutorial is helpful. This entry was posted on January 14, 2012 at 5:24 pm and is filed under Uncategorized. You can follow any responses to this entry through the RSS 2.0 feed. You can leave a response, or trackback from your own site. Lovely stitching! Thanks for the tutorial. I love it! I want to try one, You are so creative. oh this is really well done and looks great! Well done! this is beautiful! thanks for showing how you did it! Love this stitch. I am making throw pillows for the bed and this is just what I need to accent my current pillow. Parabéns, que trabalho lindo! Obrigada por dividir conosco essa maravilha! This a great idea. Thank you for the clear instructions and great photos. Will be searching more of your work. Thank you for Sharing, it is beautiful.